Sheltering from the rain. Possibly recovering from a fight. You can see the right mandible has been severed – click on it, maybe by another’s stronger mandible. 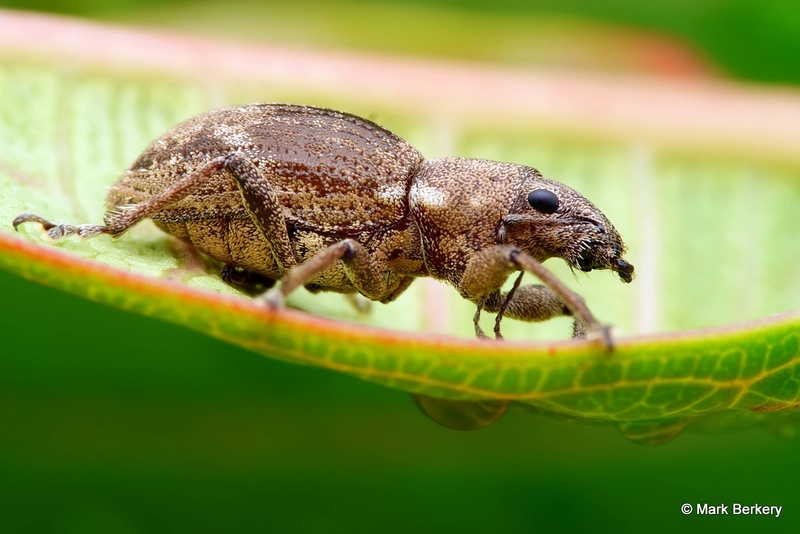 A different kind of weevil, a different aura too. With a ‘little’ rain some of the gardens inhabitants, legged creatures, climb up the other inhabitants, plants. It’s a way of surviving, it avoids drowning and other dangers and probably makes for some unlikely encounters. The first weevil looks ok at first glance. Then you might notice its drooping antennae, and its broken mandible. It’s clearly been in a battle with something, probably a bigger one of its kind, for mating rights I suspect, and looks all done in. The second one is a beauty, well groomed and completely intact, looking proud too. Maybe the winner of that battle. That’s living, both the good and the not so, and they take it in stride, instinctively. What else could they do … and remain viable. With our capacity for reflection we can choose what we acknowledge, beyond good and bad, when we can. Your pictures are like an accident scene – you want to look away, but you can’t. And even worse, you click in for a closer look. Excellent pictures of a gross subject. I think its a beauty. Once again, great shots, Mark. 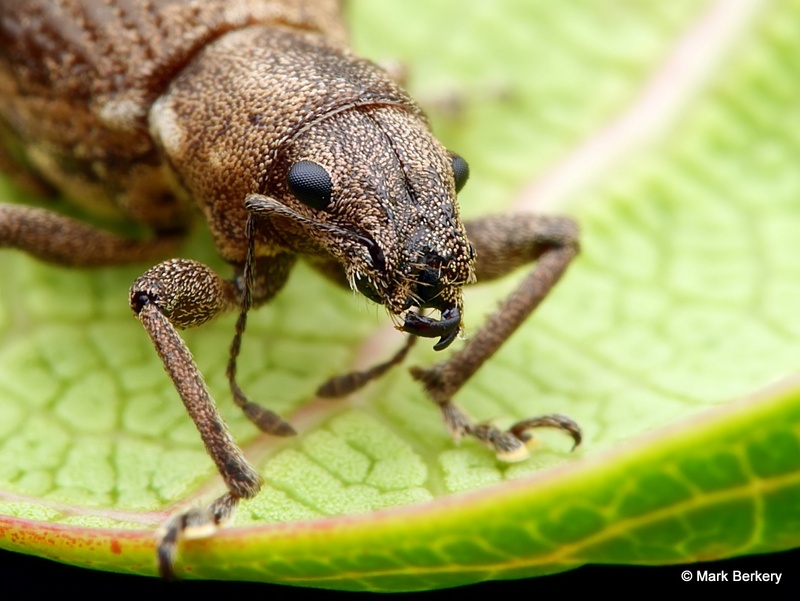 For some reason, weevils make me straightly think of J.G.Ballard / Spielberg´s “Empire of the Sun”… Amazing shots – thank you for sharing them with us. Thanks Luiza. 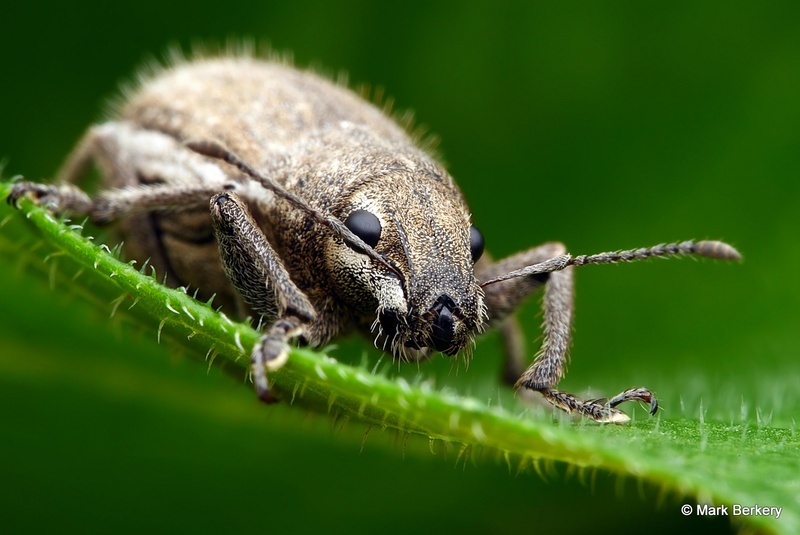 Weevils, or anything of nature, doesn’t lead me to thought of any kind. The sense they are is their most practical value, to me. Incredible as usual. Like Jane I got a lot out of going back and forwards between the two weevils, enlarging for full impact and detail. Poor No1 weevil won’t be able to feed itself with it’s broken mandible. So many little deaths. Yes I know it’s all part of the cycle of life but it’s still touching to become aware of the small creatures battles. Yes Lissa, it is a world of pain, as sensation. Nothing wrong with being touched by it. Thank god they don’t suffer – what a world that would be – the way people do. Great commentary, Mark…I enjoyed going back and forth comparing the two. 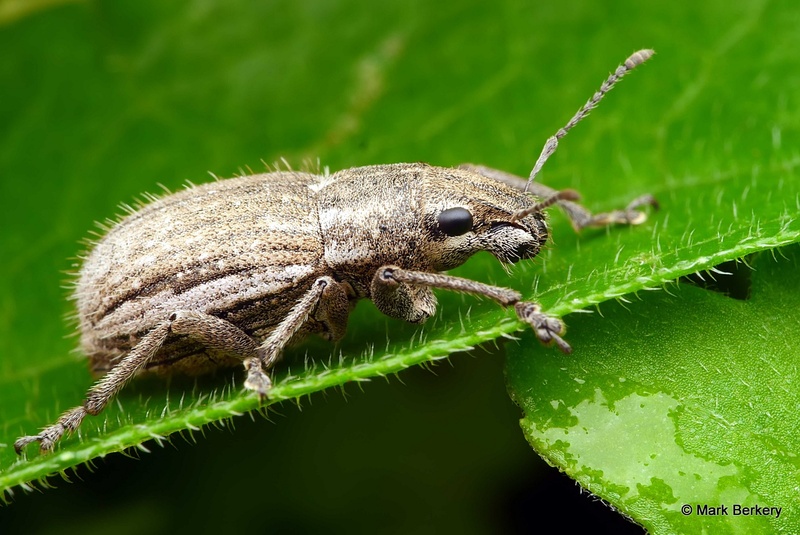 Never knew a Weevil was so good looking….and I love your title. :) Happy New Year! Thanks Jane. I think all creatures look good, they are never emotional. Except for animals who are close to man and are ill treated or neglected. Poor guy. Yup we could learn a thing or two from weevils. They are such cool critters. I rarely see them. I’m going to try your moldy orange peel technique come summer. Great shots as usual. I found the orange peel on a stick in the garden was best out of season, autumn or early spring – summer here is too hot for them, too many other creatures joined in – mites especially. But a compost heap is always a good attraction for insects, and good for the garden. Very fine work here Mark. I followed your site a couple of days ago but didn’t poke around much, so seeing this post and your other photos was a pleasant reminder. You take great photographs! It really doesn’t matter much what gear you use. Go cheap to start with anyway. Any small (cheap) superzoom with a macro filter on it will get you going. Just start somewhere, is my advice. Have a look here – Macro Illustrated – part way down you will see pictures of my setup/s. The exif is in files so you can tell what has been used and how, more or less. Marvelous! And for some reason, I really like the weevils. They’re adorable. Thanks Lisa. Maybe something to do with soft and rounded, and not sharp and spiky.